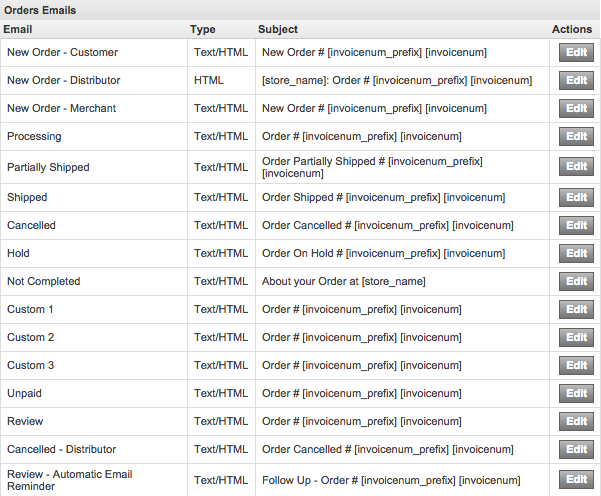 Your internet store automatically sends emails to your customers for a variety of transactions such as New Order, Order Shipped, and more. You have the ability to edit these email templates that are sent. To access these templates, log into your Store Manager and go to Settings Design Emails. 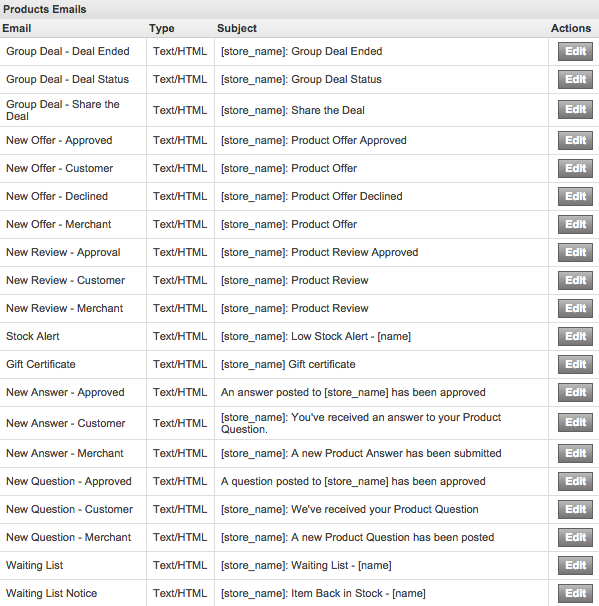 CRM - New Ticket: Email sent to the merchant when a CRM ticket/request is submitted. 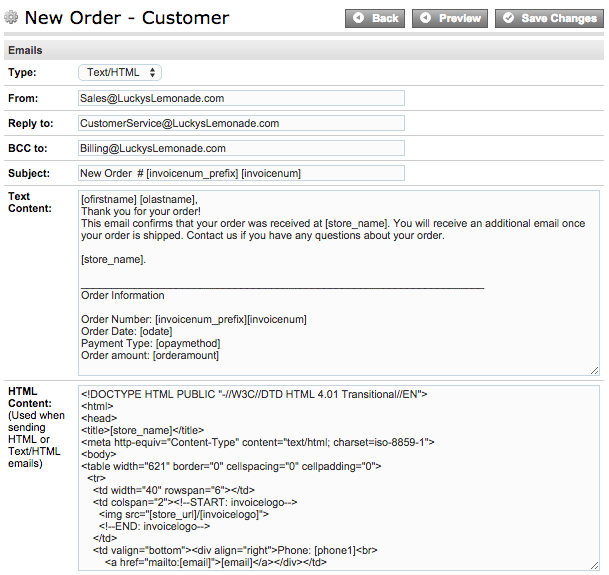 Note: The CRM - New Ticket email contains the basic CRM ticket information. To reply to and process the ticket, you are required to log into your account's CRM from the Store Manager. Note: It is recommended that you copy and paste the existing template information into a text editor and save the information on your computer prior to making any changes to the templates. By doing so, you can revert to the original template if necessary. From: This field displays as the email's From address. If left blank, the email will appear as coming from the Merchan email specified in your store's Merchant Information panel (Settings General Merchant). If this field is filled in, it must contain a properly formatted email address (email@maildomain.com), or the message will not send successfully. Tip: If you'd like to prevent an email from ever sending, you can enter "Do Not Send" in the From field. Reply to: If the recipient replies to the email, this field determines which email address the message will be sent to. For instance, you may want to have the message come "From" sales@yourstore.com, but if the recipient replies to the message you may want it sent to customerservice@yourstore.com. The email address entered must be a properly formatted email address (email@maildomain.com). If this field is left blank, the reply email will be sent to the email address in the "From" field. BCC to: This field will blind carbon copy (send to without being listed as a recipient) the message to any email address you enter. 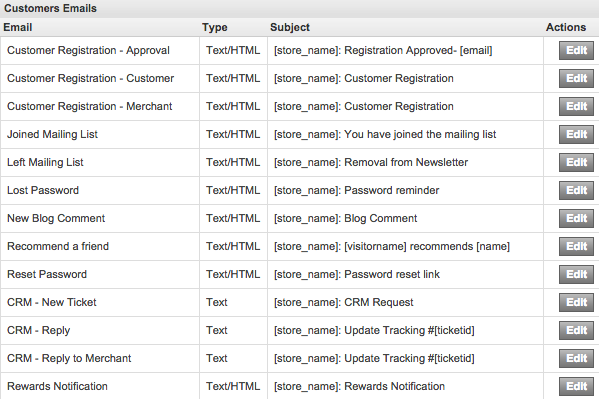 This is useful for sending the email to a third recipient in your organization, such as billing@yourstore.com. Since this field is a blind carbon copy, recipients will not see the email address listed on the message.